The above is a url for an article about an ecological shoe company, po-zu. I was gratified to read that the company uses natural rubber for soling and stitches the soles on, as I do. My dream is that many of you will start your own “eco-shoe” company, maybe locally where you are, which solves other ecological problems caused by long-distance transportation. Yes, the natural rubber soling comes from afar, I’m waiting until someone figures out how to make soles from something local – right now that would be tomatoes and raspberries! This po-zu shoe might get your creative juices flowing, it’s like a medieval moccasin but with “petals” that continue all around the foot, then are stitched in place. And the lace around the top assures that it will stay close against your foot. Do you have any scraps of leather around? What color of petals would you use? ● Sven estimates that nine out of 10 soles are petroleum-based because these are the cheapest to make. ● According to the US Environmental Protection Agency, at least 95 per cent of leather is tanned using chromium. Chromium (VI) is the most persistent toxin used by the leather industry; it is a known carcinogen, with documented adverse human health effects such as skin rashes, ulcers, kidney and liver damage, and lung cancer. Chromium can also make soil infertile and severely affect aquatic life (see also ‘Hell for leather’, page 20). ● Even synthetic leather regarded as ‘vegetarian’ is often made from petroleum-based substances. 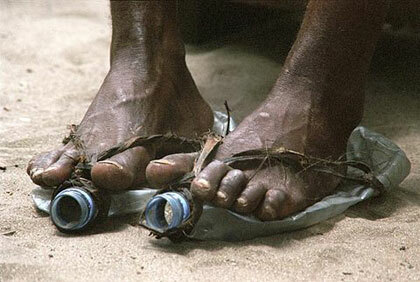 ● Toxic solvents used in adhesives endanger shoe makers, especially when there is poor ventilation. Benzene can cause headaches, vomiting and, in severe cases, respiratory and circulatory failure, and death. Exposure to this carcinogenic compound has been associated with leukaemia and health issues including aplastic anaemia . I’m so happy that a post on the facebook page of “leather for the love of it” mentioned that you are carrying Aquilim 315, a contact cement substitute. I recently ordered a small jar of aqualim 315 from a European supplier a few months ago and do love it, although the shipping costs were daunting – and now I see that I can get a much bigger quantity from you for about what I paid for the little one – thank you! It seems odorless to me, and spreads so nicely – I did a test on different combinations of soling materials to see how well it adhered them together; unfortunately it’s not very effective in adhering anything to the natural rubber soling that I like to use, but it’s great w/ Vibram Ecocrepe (30% recycled tire) – the Ecocrepe bonds well to itself (important for adhering a heel) and it also bonds the Ecocrepe well to vegetable-tanned leather. I don’t think I need Aquilim GL, rubber cement substitute – I recall seeing a video of your in which you applied rubber cement to leather then laid a stencil over it and brushed chalk dust (?) over the stencil so the pattern is clearly copied on to the leather – is this what you use Aquilim GL for? – and that’s not a process I use, so I think the 315 will do for every job I have, unless you have more uses for it.. Being able to re-use brushes is a challenge so i’d like to try yours – should I try the blade brush and the wide brush with silicone bristles? If you think they would both be interesting and useful w/ Aqualim 315, please send them both. i’m wondering about the Crosslinker waterproofing agent – isn’t the contact cement bond waterproof as is? And, I must admit that I haven’t used the skiving knife I purchased from you because i don’t know how to sharpen it! Now I see that you’ve got sharpeners for sale – more gratitude! Since I teach stitchdown shoemaking I’d like to offer students the less-expensive and manual way to sharpen, but I’d better learn how to do it myself first. The Aquilim GL is a rubber cement, so it’s a temporary bond. Cowboy boot makers use rubber cement to put boot tops together before they stitch them. I don’t find a lot of leather workers outside of cowboy boot making who regularly use rubber cement. But for those who do it’s a great substitute. When I use it for marking the design onto leather, I thin it with water so it’s easier to remove when I’m done. I prefer the blade brush for use with the 315. The bristle brush doesn’t clog with the GL but it does a little with the 315. The cool thing about the blade brush is that it doesn’t have to be stored in the glue so you don’t need a special glue pot that accommodates a brush. You can keep it in any sort of jar, spread it with the blade brush, and then just lay the brush down until you’re ready to use it again. When you pick it up you can peel off the old glue and you’re ready to go. Because the Aquilim glues are water based, water is technically the solvent for them. They’re advertised as water resistant but not water proof. You wouldn’t want to use them for a project that would be repeatedly submerged in water for example. However, I can tell you that I’ve used the 315 for projects that I did submerge in water and not had any problems. I haven’t gotten to experiment with the crosslinker yet but it sounds like a pretty simple process to use it. Sharpening is hard, isn’t it? What I like about the sharpener that I sell is that it has a guide so you’ll sharpen at the correct angle. I made this NOMOC a few days ago, so I haven’t waited very long to tell you about it! I have been working on the design for a “First Footsteps” toddler’s shoemaking kit with the hope that the technique might work for adult shoes as well – so I finally had the spaciousness in my life to try to make one – and I’m delighted with the results. You might wonder “what is a NOMOC?” As soon as I complete the patterns I’ll be putting out a new book, How to Make Nomocs, Lowmocs and Fomocs. I realize no one is going to be googling for any of these “key words”, but they are new ways of making shoes so I had to create names for the techniques. Actually, the techniques may not be all that new, but having the directions and patterns all in one book is a first, I think. So, to describe what a “Nomoc” is, I have to tell you what a “Yesmoc” is, which is a moccasin. A generic moccasin is made when the wearer stands on a piece of leather that is larger than the sole of the foot, so the excess is gathered up around the foot, where it is stitched to a piece of leather on the top of the foot. With a Nomoc, you stand on a piece of leather (or a piece of leather with a thin rubbery bottom sole, as in the shoe above), but it hardly gathers up around the foot at all – just 1/4″ is added to your foot pattern. To make this Nomoc, I cut out a pattern for a ghillie upper from How to Make Simple Shoes for Women with your own two hands! and stitched it to the sole, from the outside. Of course one needs to know where to punch the stitching holes, which is an important piece of information that will be found in the new book. While I’m at it, I’ll share that Lomocs are made much like moccasins, with about a 5/8″ border of leather added to the foot pattern. They can have unlimited styles of uppers attached to them. “Fomocs” are another name for Soles with an Edge – instead of leather being gathered as it comes up around the foot, a band has been stitched to the sole, so there are no gathers, giving the shoes a little more of a “cosmopolitan” look, as opposed to the “casual” look of Lomocs. I hope to complete the book in the next month or so – a big push will come when my husband goes on a two-week-paddle in Maine in July. I don’t know the origin of this photocopied book or its title, but it might be of interest to those of you who have seen people having their feet and legs duct-taped at Renaissance Faires and have wondered about the process for transforming the tape into patterns for boots – and then the process for transforming the patterns into some of the beautiful boots seen at faires. Seen here is a photo of a simple Renaissance-Faire boot that I have made, but it’s made by the stitch-down process, so there is a little edge turned out where the upper meets the sole – I offer a DVD and patterns for making boots by this process). In traditional “ren boots”, this seam is turned in. If you’re not familiar with these boots, simply google and you’ll find all sorts of “Renaissance Faire boots”. To view this book, click on the link below. I am so happy to provide you with a link to the Rhode Island School of Design Shoe Design to Italy video! I had the opportunity to teach a few shoemaking basics to the students when they first came back from their trip, and have been anxious to see the shoes that they made as the fruition of their experience. How could shoes for beginning walkers be more healthy than these! Made of leather with natural rubber soles, they have a wide toe area, no heel and flexible sole – as close to being barefoot as possible, yet the little feet inside the shoes are comfortable and protected. These shoes are good for both the child you love and for our shared environment. 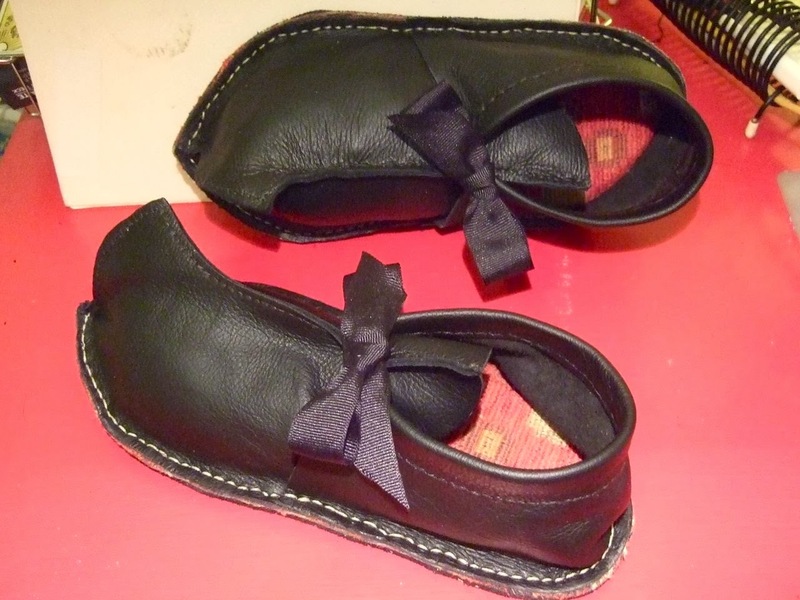 Shoes are size 4 – good for shower, birth or first birthday gifts – or any time in-between! To attend the workshop, purchase the shoemaking kit from All Things Local – or you can purchase one at the workshop. Bring it with you to the workshop and we’ll assemble them together. The kits are being sold for $15.00 (they will regularly be $25 – $30.00) at this time so a variety of children can “test-walk” them before we solidify the design. Please email Sharon to let her know you plan to participate. The shoemaking kit offers patterns for children’s size shoes from 3 to 6, so you will have the experience and patterns to make many more shoes. 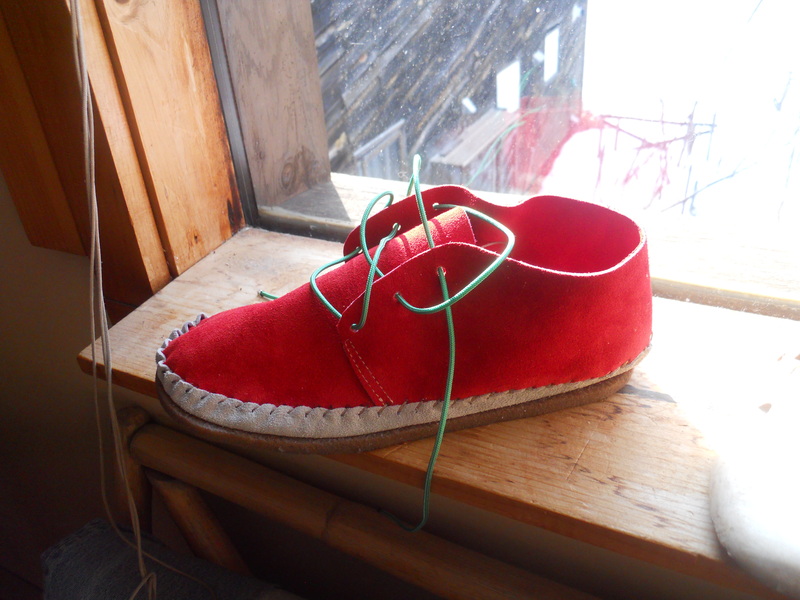 I’ll soon be offering a new book – How to Make the Simplest Shoes with your own two hands! It will describe and offer patterns for a process I’ve wanted to tinker with for a long time – and recently a few things aligned, especially during the creation of “First Walkers” shoemaking kits for toddlers. While making the prototype for these shoes I experimented with bringing the sole up higher around the edge of the shoe – my granddaughter seemed to struggle a bit with the flat turned-out stitch-down soles while learning to walk. It seemed she needed shoes that were more rounded, more foot-shaped. Then I wanted to try bringing up the edge of the soles of women’s shoes. So here’s a photo of my first try! (and yes, that’s deep snow still in my yard..) I call this style the “low-moc”; it’s made somewhat like a moccasin, but the sole only comes up about 3/4″ around the foot. Any of the uppers from How to Make Simple Shoes for Women can be used for making these shoes – just use a compass to cut off 3/4″ from the bottom edge of the pattern! you don’t need a belt sander to even the edge of the sole as you do when making stitch-downs (the stitch-down edge is composed of the bottom edge of the upper, the topsole, and the bottom sole) – lowmocs have only the bottom sole. STAY TUNED! I’ll soon have a new website, along with these new simple shoemaking products. I was delighted to receive a link to a blog post entitled “the anarchist’s shoes” describing the author’s first efforts at shoemaking – and for that preliminary project she chose to make shoes for an anarchist with bunions and curled toes! She used information from my blog post on how to make shoes for someone with swollen feet, plus her own ingenuity – lots of it! – to construct the shoes. I find it very interesting, how choices are made regarding materials, construction, tools; each pair provides ample opportunity for flexing our problem-solving skills. What an unique design feature the maker used to create ample toe room! is the link to a set of childen’s lasts from size 5 I believe to size 1. At $125.00 it’s a great deal. The toe is a little square for me, but it can be sanded into a more rounded shape if that’s what you want. You can use lasts to make patterns over, as well as have a foot of the right size always available to try your creations on. The sale ends tomorrow.